اعوانی, غلامرضا. (1389). Is ENS PER SE the Definition of Substance in Avicenna. دوفصلنامه جاویدان خرد, 06(10), 2-25. غلامرضا اعوانی. "Is ENS PER SE the Definition of Substance in Avicenna". 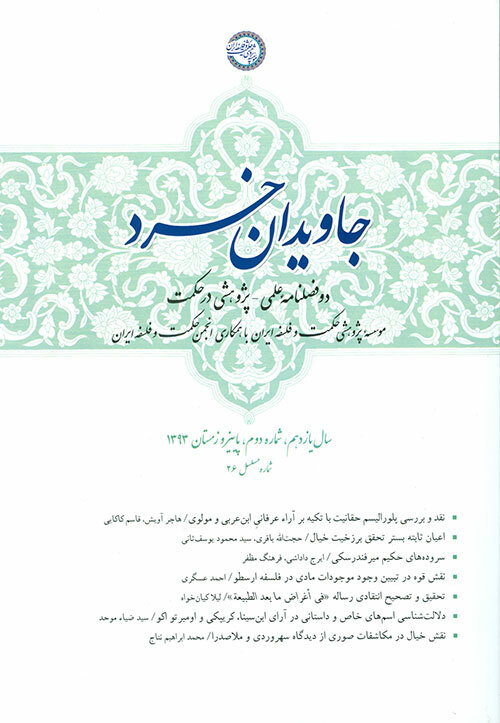 دوفصلنامه جاویدان خرد, 06, 10, 1389, 2-25. اعوانی, غلامرضا. (1389). 'Is ENS PER SE the Definition of Substance in Avicenna', دوفصلنامه جاویدان خرد, 06(10), pp. 2-25. اعوانی, غلامرضا. Is ENS PER SE the Definition of Substance in Avicenna. دوفصلنامه جاویدان خرد, 1389; 06(10): 2-25.